These Spoke lights are not just for safety, but they are cool! 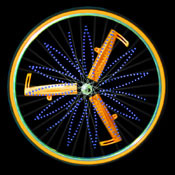 Spoke Lights are transparent "blades" that attach to your wheel spokes. As these blades spin, a computer inside the blades modulates the internal LED lights so that design images and custom text appear. 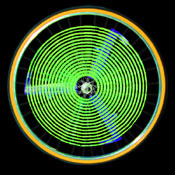 The user can decide how many spokes in a variety of colors they want to place on the wheel. Up to 6 "Blades" can be placed on each wheel. The more blades, the more visibility and persistence of vision at lower speeds. 2 Blades/Wheel look good, 3 Blades/Wheel look great, and more than three look amazing. Blades are sold individually for $24.95. 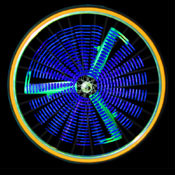 Spoke Lights are designed so that they fit virtually any standard wire spoked wheel diameter of 24" or greater. 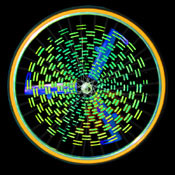 Each Spoke Light contains a number of designs and messages. The blades can cycle through all the designs or can be set to play a custom text message all the time. Play mode is selected by using one of the waterproof keys located on any blade. Red, green, yellow, orange, blue or rainbow lighted versions available. NOTE: To order multiple spoke lights you must add them to your cart 1 at a time! 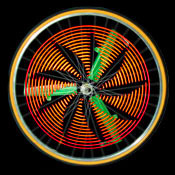 MUST HAVE BICYCLE SPOKE TYPE WHEELS TO ATTATCH. * Fits on virtually any wheel with any spoke lacing configured 24" or larger. * Lasts up to 48 hrs continuous usage on a set of batteries, Easily installs with a Phillips screwdriver. Shock resistant for excellent over-the-road performance. 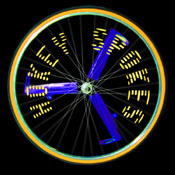 * Each Spoke Light can display all of the designs shown on this page, and will communicate with other Spoke Lights on your wheel to display the same design at once. * You can choose either to have the spokes go through the all the designs, one at a time, or to constantly show your text message. Click the button below to add the Spoke Lights to your wish list.